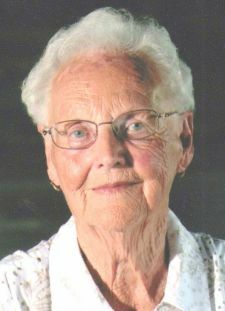 Evna Conner Eanes, 97, passed away Friday afternoon, January 25, 2019, at UNC-Rockingham Rehab & Nursing Center in Eden. A funeral service will be held at 3:00pm on Sunday, January 27, 2019 at Central Christian Church. The family will receive friends one hour prior to the service (2 - 3pm) and other times at the home of Frances Hill; 1422 Hopkins Ct., Eden, NC. There will be a private burial service held for the family at Roselawn Memorial Gardens on Monday, January 28, 2019. Mrs. Eanes was born September 8, 1921 in Floyd Co., VA, to the late Oliver Tazewell Conner and Martha Bolt Conner. She was a retired employee of Fieldcrest Mills and a life-long member of Central Christian Church. Evna also kept and cared for many children over the years and they all remained special to her. She is survived by her son, James L. Eanes and wife, Joan of Axton, VA; her three daughters, Frances Hill and husband, Tommy of Eden, Rose Collins and husband, Robin of Ruffin and Brenda Hundley and husband Duane of Mayodan; three sisters, Dovie Gilbert and Elsie Capicotto both of Eden, and Rheta Wilson of Florida 9 grandchildren; 17 great-grandchildren; 1 great-great-grandchild. In addition to her parents, she was preceded in death by her husband, Fletcher Daniel Eanes; daughter, Mary Lee Hayden; grandchildren, Bobby Lee Murphy, Barry Wayne Murphy and April Hayden. The family would like to extend sincere thanks to UNC Rockingham Nursing and Rehabilitation Center and Hospice of Rockingham County. Memorial contributions may be made in Mrs. Eanes memory to either, Hospice of Rockingham County; P.O. Box 281, Wentworth, NC 27375 or Central Christian Church; 233 E. Stadium Drive; Eden, NC 27288.